When Instagram shots of Carmine's parmas started popping on to my radar I knew it was one we had to try. Massive schnitzels covered in mountains of toppings of all different shapes and sizes and absolutely beautifully presented. We normally avoid Italian Restaurants as they tend to lean towards the really traditional (Bolognese sauce with really thin schnitz's), but from what we could see of Carmine's they really hit the nail on the head. We ran the gamut of oh-so annoying spruikers on Lygon Street, headed into Carmine's and grabbed a table. It was relatively quiet inside, but we were pretty early and Thursday night isn't exactly the hippest night to hit the town. Being quite new compared to some of the other Lygon St. establishments (opened in 2014), the interior of Carmine's is a fun mix of eclectic and traditional. Past the full sized horse sculpture with a lamp on its head you'll find comfy overstuffed leather chairs, checkered red and white tablecloths and a very professionally made cocktail or two. The service at Carmine's is absolutely stellar. Every person we dealt with gave the vibe that they would bend over backwards for anything we needed. Beers were never left empty for more than 20 seconds and it never seemed as if any of our whims were a hassle - If we gave a score for service Carmine's would easily be a 10 out of 10. We grabbed some menus, as there were some novelty options to choose from. 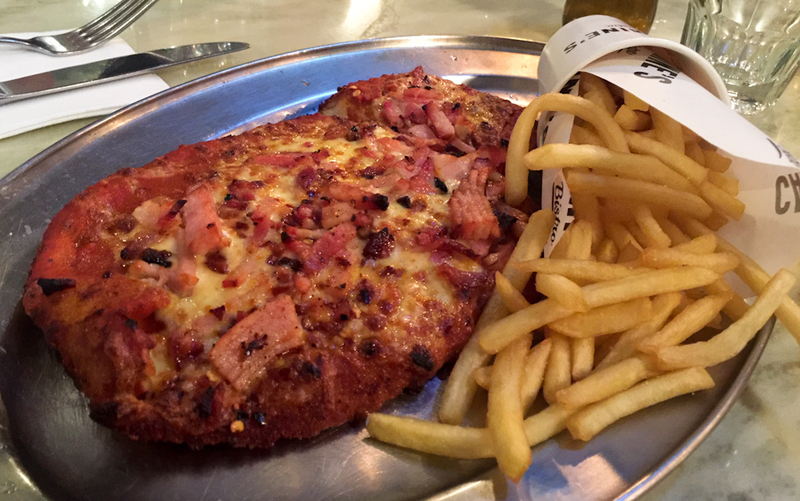 Normally with novelty toppings for parmas pubs/restaurants will pretty much pull out their pizza menu and chuck that on top of a schnitzel (the toppings listed in the menu, not the menu itself. That would taste terrible) - Carmine's has done something different, in that it seems that their novelty varieties are based on pasta sauces and not pizza toppings. A slight change, but definitely something we haven't seen before. Points for originality. I opted for the Amatriciana parma, normally I would go the traditional but as my go-to pasta sauce is Amatriciana I just couldn't pass that up. Points for presentation as these parmas looked outstanding on the plate. The schnitzel was big enough on its own, but then an extra half-schnitzel was thrown in to the side for good measure, melded together with the toppings. First thing of note was that the crumbing on the parma was sheer perfection. Thin, great flavour and had the perfect crunch. The chicken beneath it was also top quality. Not too thick, but lovely and juicy. Definitely a solid foundations for the toppings above. Speaking of toppings, they weren't tight with them at all. I think half a pig's worth of pancetta wound up atop my parma. I was expecting a little more punch from the chilli napoli but unfortunately it failed to delivery, offering only the faintest hint of chilli oil on the palate. I enjoyed my parma and walked out satisfied, opinions around the table were mixed. Those who had the Carmine's parma echoed my sentiment of expecting more of a kick to the chilli, saying it came off as a little bland in practice. Oddly enough those to have the least complaints about the flavour were those who opted for the traditional parma, claiming that there was a delightful smokiness permeating the dish that really brought it to life. 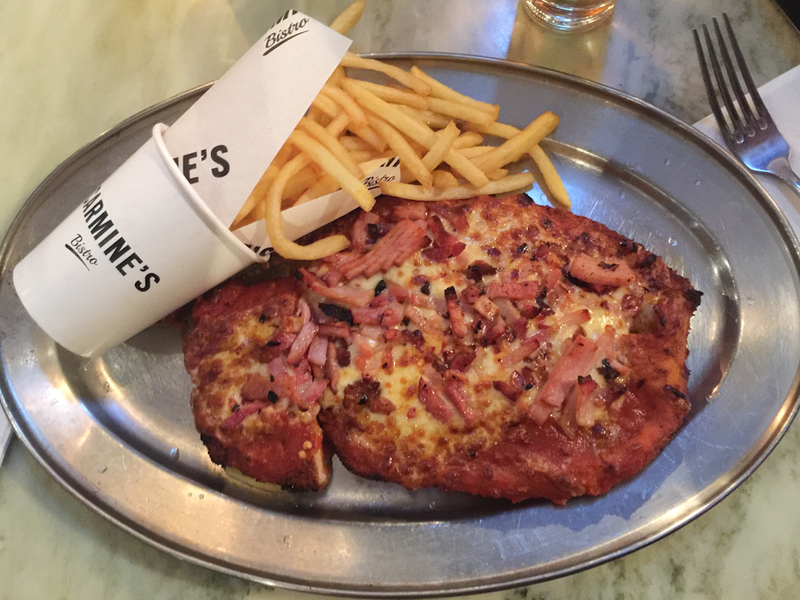 It's no surprise at ParmaDaze that we aren't a fan of french fries (aka Maccas chips), but at least when they're done at Carmine's they're presented in style. The tipped-over-paper cup is a unique and eye catching way of presenting fries which (for fries at least) weren't that bad, and the pot of sauce delivered to the table without request was definitely appreciated. In a very controversial move the parma at Carmine's is delivered with no salad whatsoever. Quite a disappointment, as with the sheer size of this parma it needed something fresh to break it up. Fried chicken upon cheese upon pancetta with a side of fried potatoes is a lot to handle at once without the ability to take a breather and grab some fresh cucumber. I know quite a few of our readers couldn't care less about the salad, however in our opinion a quality salad would have really brought this parma to life. The previously established "You don't win friends with salad" rule has been invoked for this review. At $26.50 for standard and $28.50 for novelty this isn't exactly a cheap parma (if you're after a discount parma option on Lygon check out Universal up the road). 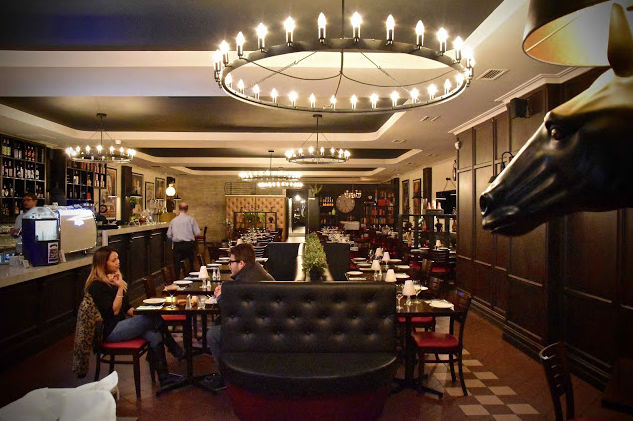 Is the Carmine's parma worth the price tag? Maybe. The ingredients were all top notch, they weren't at all tight with the toppings and everyone walked away clutching their stomachs as they were so full - Yet the lack of even a hint of salad definitely hurts, especially at this price tag. I had a lovely evening at Carmine's, and if you find yourself on Lygon street then it is definitely a restaurant to consider if you feel like a classy night out. The service was outstanding, the restaurant was lovely and the parma, while missing the mark on a couple of small points, and taking a pronounced hit in score due to lack of salad, was extremely enjoyable. I'd definitely go back, but would probably stick to the traditional parma over the novelties, as that appeared to be the best of the bunch. Worth a crack if you're in the area.